The cluster topology is defined by the type and state of each node in the cluster and the relation between them. Clusters are typically composed of any odd number of nodes equal or greater than 3, see Clusters Best Practice. See the Cluster API page for usage examples. In Rachis every cluster node has a state and a type. and elect a new leader when needed. Member A fully functional voting node in the cluster. 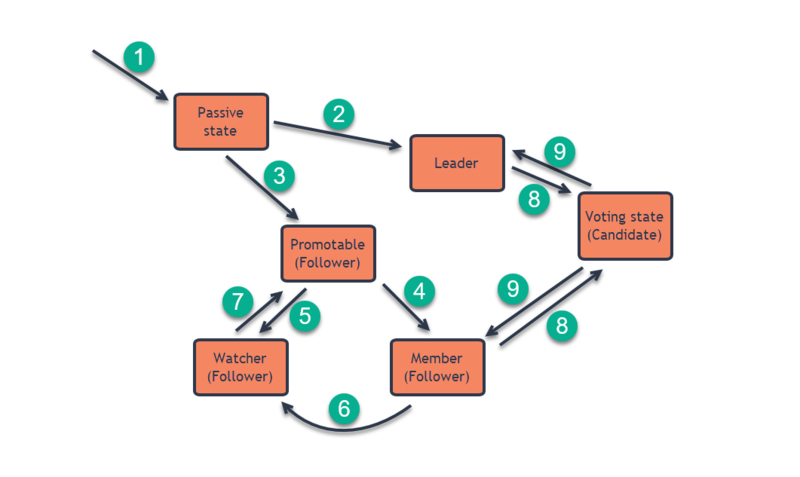 This is an intermediate stage until node is promoted by the Leader to a Member. Watcher A non-voting node that is still fully managed by the cluster. Can be assigned with databases and tasks. See more below. The Rachis state defines the current role of the node in the cluster. Passive Not a part of any cluster. Every newly created RavenDB server starts at the initial Passive state. or it can be added to an already existing cluster. A node that is removed from the topology moves back to the Passive state. Candidate Has no Leader and tries to get elected for leadership. Follower Has a Leader and operates normally. Leader-Elect Just elected for leadership, but will take office and become the leader only after the dummy noop raft command was successfully applied in the cluster. Leader Leader of the cluster. See more below. 1. New server/node will start as Passive, meaning it is not part of any cluster yet. 2. When a node is added to a cluster, it immediately becomes the Leader if it is the only node in the cluster. 4. Node will become a Member of the cluster if not specified otherwise. 5. Node will become a Watcher if specified when adding the node. 6. Member can be Demoted to a Watcher. 7. Watcher can be Promoted to a Member. It will first become Promotable and a Member thereafter. 8. Member (a regular Member or a Leader - but not a Watcher) can become a Candidate when a voting process for a new Leader takes place. 9. When voting is over and a new Leader is elected, one candidate becomes the Leader and the rest go back to being his Followers. The Leader makes sure that decisions are consistent at the cluster level, as long as a majority of the nodes are functioning and can talk to the Leader. For example, the decision to add a database to a node will be either accepted by the entire cluster (eventually) or fail to register altogether. Raft Commands can't be accepted while there is no Leader or if the Leader is down. Increase your RavenDB cluster by adding Watchers with the advantage of not suffering from large voting majorities and the latencies they can incur, as watchers don’t take part in majority calculations. A Watcher can be assigned databases and tasks as a regular Member but is not included in the decisions making flow, so cluster decisions can be made with a small majority of nodes while the actual size of the cluster can be much higher. Any number of Watchers can be added to handle the workload.